Friends of Katavi Ecosystem (FOKE) is a non-governmental, non-profit making, multi-institutional stakeholders consortium working to support the conservation the Katavi-Rukwa Ecosystem in Western Tanzania, to implement the wise use of its natural resources and to assist in the sustainable development of local communities. FOKE provides an institutional framework for participation of all stakeholders in discussions and activities to save the pristine Katavi-Rukwa Ecosystem cultural and natural resources. The FOKE SECRETARIAT is based at Sitalike Village, near the Headquaters of Katavi National Park. It is charged with the task of implementing, in close consultation with the Management Committee, the decisions of the FOKE membership. It plans, directs and reports on the progress made in carrying out the actions agreed upon by the members. 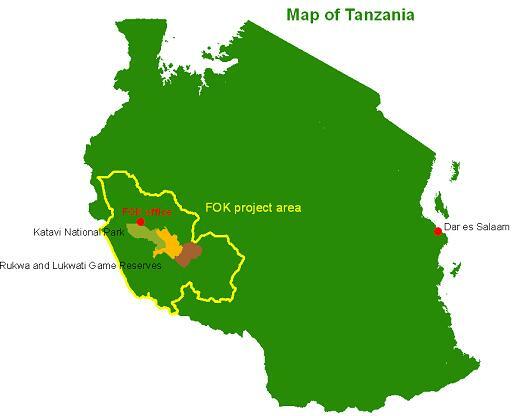 Working closely with Tanzania National Parks, Wildlife Division, Mpanda, Nkasi and Chunya District Councils, FOKE’s broad-based membership aims to safeguard the integrity of Katavi National Park, Rukwa-Lukwati and Lwafi Game Reserves and propel local community development and empowerment.